Homemade wedding cards! 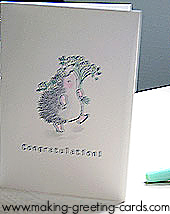 Well, I had to make one wedding congratulations card fast. My mom and I were invited to a wedding dinner. The groom was the son of my mother's best friend. Usually, we give cash in a red packet. 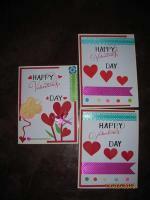 But because I make my own cards, people expect a homemade card from me whatever the occasion. So a homemade wedding card it was. I did not have any wedding stamps and didn't have time to create a wedding image so I chose something lovely, cute and simple from my collection of rubber stamps. Cool! Right? Well, it's definitely a very simple card and quick to make too. Here are the supplies needed and detail instructions. Tips: Remember to sign your card. 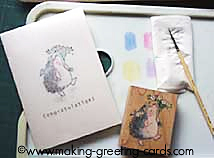 Stamp a small image behind (back of card) and sign your name or initial under the stamped image and if you like, date it too. Be proud of your creation. 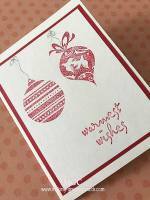 Score cardstock and fold to make a blank basic card. Ink the Penny Black rubber stamp with black inkpad and stamp onto front of metallic card. Stamp the word 'CONGRATULATION!' below the image. Stroke markers on the palette to form color pools of your chosen colors. Wet a brush and pick up color from the color pools on the palette. 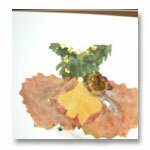 Apply color to the stamped image with the brush. PS: My card was made at the last minute but if you have time, you can and should add the followings: Apply glitter glue to the flowers. Tie a thin gold string on the fold. 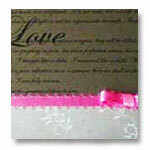 Print inside message on vellum or stamp a message if your have the appropriate message stamp. 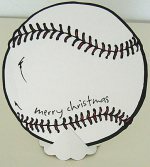 Insert into the card and tie with a gold string. These are homemade wedding cards created by readers here who submitted them online. 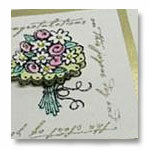 Wedding congratulations cards as well as Anniversary cards by readers. 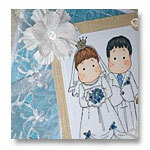 A LOVE Wedding Card by Barbara Dickason from Ohio, USA. 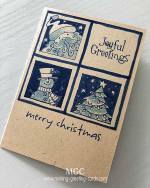 Anita Cher from Malaysia is also another card maker and has send in this beautiful wedding greeting card to share with us. 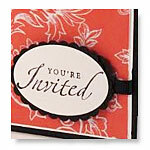 Lynne from Scotland sent in this Invitation card.